Editor’s intro: Read about how among other things, this helpful bioactive liner provides isolation and protection for the freshly placed bioceramic repair material while it is setting. The versatility of applications offered by the calcium silicate bioceramics has been ideal for clinical endodontics.3-5 The long setting time, ranging from 1 to 4 hours, combined with their excellent clinical handling properties allow easy, no-rush surgical and nonsurgical treatment. However, in applications where a final restoration needs to interface with the bioceramic cement, a second appointment has been required in order to allow ample time for the bioceramic layer to achieve final set (Figures 1A-1D). This rule has even been extended to calcium carbonate-based bioceramics that take up to 2 weeks for their final set.6 This long final set is a hallmark of all pure bioceramics and has been an inconvenience to both the patient and the operator and a place where improvements were deemed necessary. Recently, a new bioactive, dual-cure liner has been developed by our team that promises to bridge the gap in this specific application. The purpose of the new BC-Liner (Brasseler USA®, Savannah, Georgia) is to cover the freshly placed bioceramic repair material to provide isolation and protection for the material while it’s setting. Meanwhile, the liner can act as a more compatible surface to bond the final restoration material. Furthermore, endodontic work can continue immediately after coverage of the bioceramic with the dual-cure liner without the fear of the bio-ceramic washing out. In this case, the bio-ceramic liner is acting as an interface between the bioceramic repair material and the restorative material (Figure 2). Figure 2: The use of BC-Liner allows immediate restoration after a bioceramic is used to repair a perforation. A thin layer of BC Liner is placed immediately over the bioceramic layer, is light-cured, and then the final restoration is bonded to it immediately. Whenever a resin component is present in a root repair material, you can expect its biocompatibility to be lower than a pure bioceramic. Pure bioceramic formulations devoid of any resin components are therefore more biocompatible and better suited for situations when a barrier material is to interface with pulpal or periodontal cells. This biocompatibility advantage is especially important during perforation repairs and pulp-capping procedures where the barrier material interactions with cells should not induce additional inflammation. This is why the liner is not designed to be placed directly over the cell baring surface, but instead to act as an interface between the more biocompatible pure bioceramic and the final restorative material. Therefore, in such application, the pure bioceramic barrier seals the defect and is in contact with cells for the most biocompatibility (Figure 3). The defect itself is not sealed with the liner, but the liner would be a good interface between the unset pure bioceramic and the final restorative material. This technique is developed to help combine the advantages of pure bioceramics with bio-active hydrophilic resin compomers. (Editor’s note: Compomers is defined as materials that combine the benefits of composites and glass ionomers.) In this version of the “Lid Technique,”6 a pure bioceramic is used for pulp capping or perforation repair material directly over cells, followed by placing a layer of resin containing bioactive liner on top of it as “a lid.” A final restoration is then bonded to the liner to complete the procedure. This technique allows the liner to act as an interface between the pure bioceramic and the final restoration, allowing the benefits of both pure bioceramics and dual-cure bioactive material to help improve the clinical efficiency of the procedure to a single appointment. Figure 9: 9A. Immediately after BC Putty placement, the remainder of the chamber was filled with the new BC-Liner (Brasseler USA, Savannah Georgia), 9B and was light cured. The following clinical case demonstrates this technique. A young female patient had recent root canal therapy, post and core, and crown by her restorative dentist before the tooth became symptomatic. A consultation radiograph revealed a large post perforation that had gone unnoticed during treatment! (Figure 4). The options of extraction versus an attempt at saving the tooth through post retrieval and perforation repair were explained. An access was made through the intact crown (Figure 5), and the post was isolated and removed (Figures 6A-6B). Once the post was removed, the perforation was isolated through the access. Some gutta percha from around the perforation site was removed until a rim of clean dentin was observed around the perforation site. The space was adequately disinfected using negative pressure and 5.25% NaOCI and dried (Figure 7). The post space was then filled with the pure bioceramic, BC Putty™ (Brasseler USA®, Savannah Georgia) incrementally, for the entire length of the post space. (Figure 8). At this point, the unset BC Putty constituted the floor of the access. Previously, placement of a final restoration would not have been possible under these circumstances, as etching and bonding to this material would not have been possible. However, in this case, if a final restoration was to be placed immediately after this repair procedure, a 2 mm-3 mm layer of BC-Liner (Brasseler USA, Savannah, Georgia) would have been placed against the BC Putty, light-cured, and the remainder of the access cavity would have been etched, bonded, and filled with the restorative material of choice. In this case, however, the remaining space was filled with BC-Liner all the way up to the cavosurface margin of the crown, and it was light-cured in place (Figures 9A-9B). This was due to the determination of the poor quality of the crown, which required replacement as soon as the salvageability of this tooth was determined. Therefore, the liner was used in this case as a long-term provisional and filled the entire access space over the BC Putty repair material until the fate of the tooth was determined (Figure 10). This was done instead of a material like Cavit™ (3M, St. Paul, Minnesota) that has poor long-term seal. If the crown did not require replacement, the restorative dentist could have drilled for a depth of about 3 mm into the opacious white-shade liner and used it as base to bond a final restoration in place. The opacious white shade of this material is deliberately designed to create contrast against dentin in order to facilitate selective removal of the material if later needed. The postoperative radiograph (Figure 10) shows the case after post removal and perforation repair, BC Putty repair, and BC Liner repair on top of the material to seal the access (Figure 11). The patient was referred back to her restorative dentist for an observation period of 12 weeks, followed by crown replacement if symptoms are resolved. The patient was followed up for a 6-month postoperative follow up visit after a new crown had been fabricated and all symptoms had been resolved (Figures 12A-12B). This case showcases the combined use of a pure bioceramic putty against a new dual cure bioactive liner optimized to use with bioceramic compounds. This post-perforation repair case was completed in a single visit as a result of this synergy. According to its distributor, BC-Liner (Brasseler USA, Savannah Georgia) has a compressive strength of 280MPa, flexural Strength of 97MPa, a self-cure time of 3-10 minutes and a light-cure time of 20 seconds using low-energy curing lights.7 These attributes help this material provide an optimal flexural and compressive strength as a liner, and its chemistry optimizes its use as a protective barrier over a bioceramic. The material itself is a bioactive, dual-cure, hydrophilic resin with ionomer glass particles, and rubberized resin components that help improve fracture resistance under shear forces and loading required by the final restoration. The use of this material in a perforation repair is also shown in this perforation model of a premolar tooth with a size 4 round bur buccal root perforation (Figure 13). In this case, the pure bioceramic BC Putty is used once again as the ideal material against the PDL cells (Figure 14). Previously, cotton and Cavit had to be used and a second appointment scheduled to allow the bioceramic material to set. By applying the BC Liner immediately against the putty and light-curing it, the operator can complete the perforation repair in a single visit and continue with the access preparation and root canal therapy without fear of the putty washing out (Figure 15). An important point of consideration for successful implementation of this Bioceramic and Liner Lid Technique in perforation repairs and pulp capping procedures is paying particular attention to extending the liner beyond the border of the bioceramic and into the clean dentin for a minimum of 1 mm-2 mm. This is where the bond to dentin will seal the underlying bioceramic from exposure to liquids on the other side and prevents washout. Furthermore, this provides a stronger bond to the dentin. Therefore, the area beyond the margin of the repair material should be thoroughly cleaned prior to the application of the repair material which should in turn be applied to the application site carefully and without much smearing. Any smearing beyond the margins should be cleaned by microbrushes and gentle water stream or the liner material applied beyond that area into clean dentin. Application of the liner borders into clean dentin is important to provide an adequate “lid” and a completely sealed environment for the underlying repair material. Furthermore, since the BC Liner material is a bioactive, self-etching hydrophilic resin with ionomer glass, it’s important to allow a few seconds of rest after application of the material to the site in order for the material to self-etch the dentin prior to light-curing. Limiting the light-curing process to a short few seconds and only to the surface of the liner while allowing the bulk of the material to self-set will further limit polymerization shrinkage in this class of materials. In summary, the introduction of the BC-Liner as a class of dual-cure bioactive materials optimized to interact with the bio-ceramic materials and the introduction of a technique that uses the liner as a protective layer over the bioceramic have the potential to further improve the efficiency of care in perforation repairs and pulp capping procedures that require immediate sealing of the defect with the most biocompatible procedure and the restoration of the defect or access with a final restoration at the same appointment. In such cases, the uses of a bioactive liner such as the BC-Liner material is advantageous as it interfaces between bioceramics and restorative materials bridging the gap between these two incompatible and yet uniquely useful materials. Read more about the advantages of bioceramic materials that are used with this new bioactive liner in another article by Dr. Nasseh here. Allen Ali Nasseh, DDS, MMSc, received his dental degree from Northwestern University Dental School in Chicago, Illinois, in 1994 and completed his postdoctoral endodontic training at Harvard School of Dental Medicine in 1997, where he also received a Masters in Medical Sciences (MMSc) degree in the area of bone physiology. He has been a clinical instructor and lecturer in the postdoctoral endodontic program at Harvard School of Dental Medicine since 1997 and the Alumni Editor of Harvard Dental Bulletin. Dr. Nasseh is the endodontic advisor to several educational groups and study clubs and is endodontic editor to several peer-reviewed journals and periodicals. He has published numerous articles and lectures extensively nationally and internationally in surgical and nonsurgical endodontic topics. Dr. Nasseh is in solo private practice (MSEndo.com) in downtown Boston, Massachusetts. Disclosure: Dr. Nasseh is the President and Chief Executive Officer for the endodontic education company Real World Endo® (RealWorldEndo.com). Disclosure: Dr. Nasseh helped develop this product for Brasseler USA. Tawil PZ, Duggan DJ, Galicia JC. Mineral trioxide aggregate (MTA): its history, composition, and clinical applications. Compend Contin Educ Dent. 2015;36($):247-52. Lee SJ, Monsef M, Torabinejad M. Sealing ability of a mineral trioxide aggregate for repair of lateral root perforations. J Endod. 1993;19(11):541-544. Silva Almeida LH, Moraes RR, Morgental RD, Pappen FG. 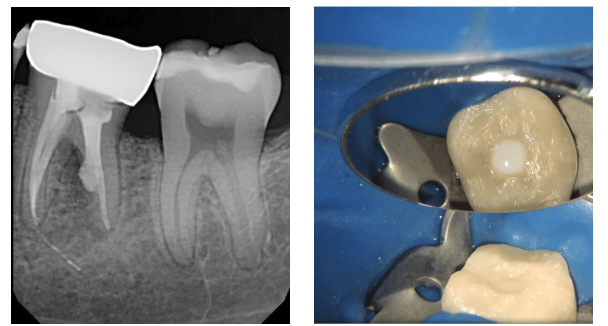 Are premixed calcium silicate–based endodontic sealers comparable to conventional materials? A systematic review of in vitro studies. J Endod. 2017;43(4):527-535. Keskin C, Demiryurek EO, Ozyurek T. Color stabilities of calcium silicate-based materials in contact with different irrigation solutions. J Endod. 2015;41(3):409–411. Haapasalo M, Parhar M, Huang X, Wei X, Lin J, Shen Y. Clinical use of bioceramic materials. Endod Topics. 2015;32(1):97-117. Nasseh AA, Brave D. Apicoectomy: The Misunderstood Surgical Procedure. Dent Today. 2015 Feb;34(2):130, 132, 134-136.